Update: Tuesday August 23, 2016 11 a.m.
Live footage of the sunken USS Independence near the Farallon Islands is still rolling! Scientists were up all night surveying the WWII-era aircraft carrier and will continue exploring until 2 p.m. PST today. 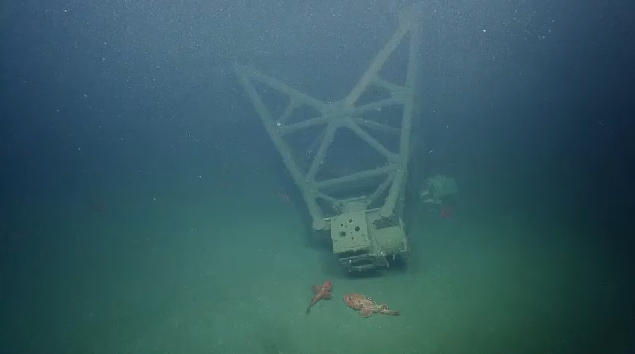 So far, they've found a hellcat fighter aircraft, the wing of a second aircraft and sponges the size of doorways. The crew erupted into cheers when it found a "Christmas tree" gauge around 10:48 a.m. The device measures pressure and protects pressure instruments against surges and pulsations. Underwater image of a "Christmas tree" gauge around aboard the USS Independence. The device measures pressure and protects pressure instruments against surges and pulsations. Marine researchers are plumbing the ocean depths of a long-buried aircraft carrier this week near San Francisco Bay, uncovering its atomic secrets and studying its second act as a haven for corals and other marine life. The USS Independence has rested unseen under 2,600 feet of water off the Farallon Islands for 65 years—until now. 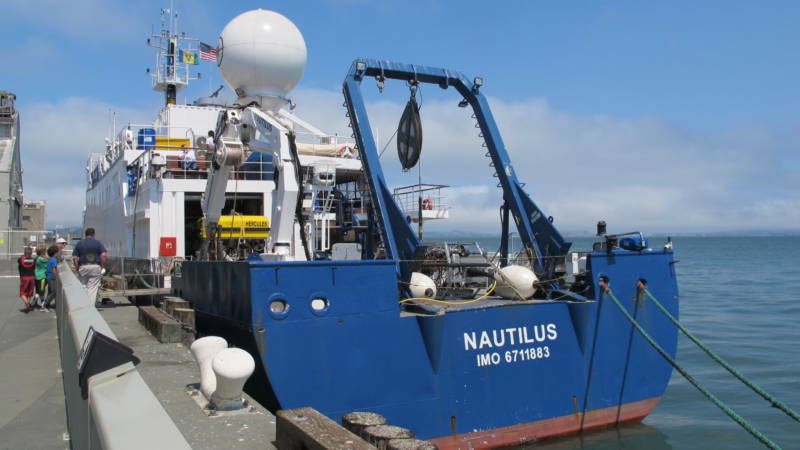 Researchers aboard the Exploration Vessel Nautilus left Half Moon Bay Monday en route to the World War II aircraft carrier, and will explore its hidden chambers until August 26. You can watch it live on a webcam that follows both the action above-decks and in the watery locker below. The crew aboard the E/V Nautilus recently brought us face-to-face with the diminutive purple googly-eyed squid off the Southern California Coast. 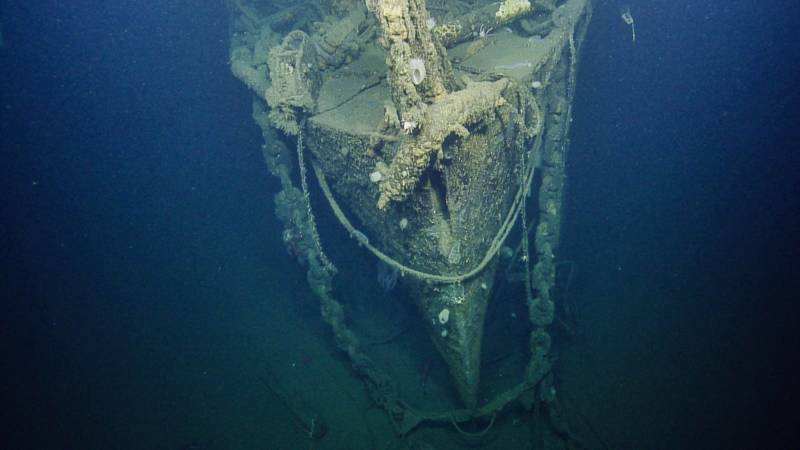 The dive to explore the remains of the USS Independence will be the first visual survey of the ship since it was scuttled after being used in post-World War II nuclear bomb tests and as a weapon of war against Japan. Researchers will emerge with "a detailed, full-on visual map of the Independence," enthuses James Delgado, chief scientist for the USS Independence mission on the Nautilus and the director of the Office of National Marine Sanctuaries' Maritime Heritage Program. "That has not been done with any big shipwreck other than the Titanic." The USS Independence joined the Pacific Fleet in 1943, helping marines and pilots lay waste to Japan and the Philippines until the war ended in the fall of 1945. It was strafed by Japanese aircraft, bombed and torpedoed, according to this rather thrilling account by a sailor aboard the vessel at the time. It was one of dozens of ships anchored off the Bikini Atoll in 1946 for a new duty: to act as a nuclear test subject. The ship survived two blasts before returning to Hunter’s Point in San Francisco to be used in decontamination studies. The battered, leaking ship was towed out to sea in 1951, exiting the Golden Gate to be scuttled, or intentionally sunk, about 30 miles offshore, near the Farallon Islands. There it joined a watery graveyard of more than 400 shipwrecks off the Farallon Islands, part of the Greater Farallones National Marine Sanctuary. The research mission is not without its dangers. The team will be bringing up samples of marine life growing on the wreck—but with extra caution, given the Independence’s nuclear past. Although they do not expect high levels of radiation, scientists from UC Berkeley are on board to test the radioactivity of any samples and instruments brought up from the wreck. "I love working shipwrecks," says Robert Ballard, president of the Ocean Exploration Trust, which operates the Nautilus expeditions. "But they’re dangerous. We have to be careful." Ballard, who discovered the remains of the R.M.S. Titanic, does not hold back his excitement about exploring the Independence -- which is roughly as long as the San Francisco Ferry Building. "We brought our A-team. Because they know when I get near a wreck, I get near it." “We’re going to get these guys very close," he adds. "And you’ll see it live." The “guys” Ballard is referring to are the ship’s two remotely operated vehicles (ROVs), Argus and Hercules, which shoot deep ocean footage and send it back to the ship’s control room and to millions of viewers on land. The two ROVs work in tandem as they hover above the seafloor, tied together with a bright yellow flexible tether. Argus is connected to the Nautilus with a long cable made of steel, copper, and fiber-optic wires; its job is to provide stability, light, and an extra set of eyes for Hercules. 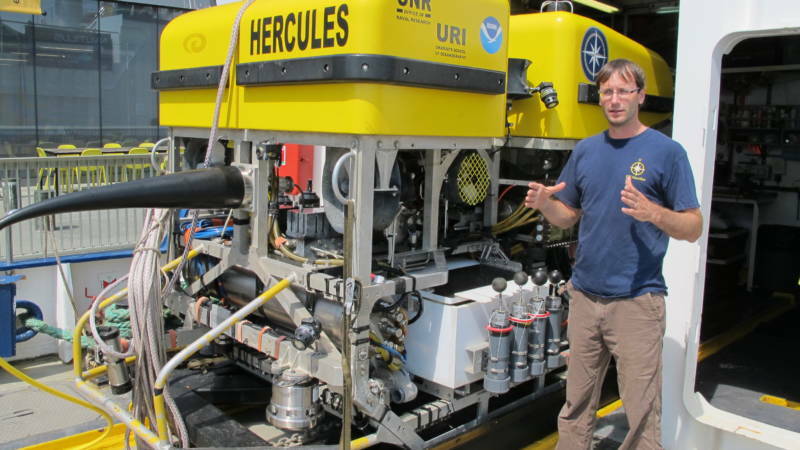 ROV technology like this gives us unprecedented views of the ocean. "And the best part is that you share it with everyone," says Delgado. "That, for me, is the magic." That magic is made possible by the ship's satellite, a giant golf ball-shaped dome which enables communication so that online viewers can write in with questions, students can watch from their classrooms, and scientists can call in with advice. "You don’t know what you’re going to encounter," says Ballard. "We run the ship somewhat like the emergency room of a hospital, not knowing what the ambulance is going to deliver." Some of those surprise encounters will be with marine life that have colonized the USS Independence in the years since its human inhabitants abandoned ship. 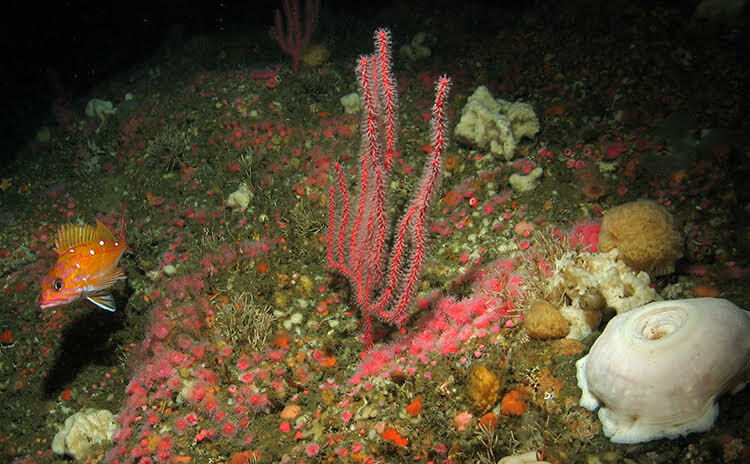 The coral and sponge communities that exist in our deep, dark backyard provide important habitat in an otherwise flat, sandy underwater world. The corals in particular are impressively long-lived. Local species can live for over 100 years — and they have growth rings that can be analyzed just like tree rings. As the ROVs explore the wreck, the researchers on board the Nautilus will rely upon a network of experts around the world, or what they call "doctors on shore," who will be watching the live stream and calling in with information and advice. "We can have people leading parts of the dive, or entire dives, or sometimes entire expeditions from shore," says Mike Brennan, the expedition leader of the Nautilus. They will have a coral expert from NOAA, Peter Etnoyer, telling crew members what to sample and identifying species from a remote location. Over time, scientists can monitor the health of corals and keep track of any changes, such as what might occur as the ocean becomes more acidic due to rising atmospheric carbon dioxide levels. The team may discover new species and even entire reefs on the ship. "Seventy-five percent of the planet is 95% unknown," says Delgado. "We know more about the moon, Mars, and soon Saturn, than we do what’s right off the coast here in a National Marine Sanctuary." "And ultimately, to really understand it, we have to go out there."